Order your own copy of Warriors of the Wind at your local retailer or online through our website today! For almost 300 years the Unicorn Clan have settled in Rokugan, yet they still retain much of the wildness and gaijin customs that set them apart from the other Great Clans. It’s not that they are unable to assimilate, but they have learned in their travels to remain true to themselves. Now, you can pledge yourself to this clan, utterly unique and set apart, even among the Great Clans of Rokugan. 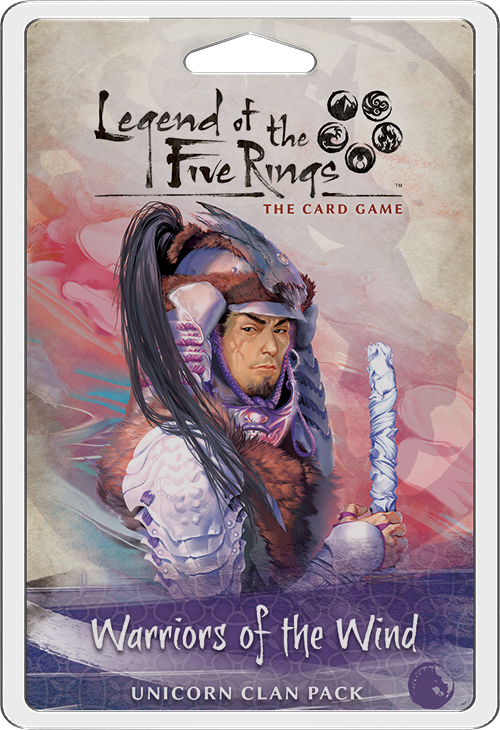 Fantasy Flight Games is proud to announce Warriors of the Wind, a Unicorn Clan Pack for Legend of the Five Rings: The Card Game! Warriors of the Wind contains 78 new cards (three copies of twenty-five different cards and one copy each of three different cards), with an emphasis on the Unicorn Clan! Warriors of the Wind celebrates all that makes the Unicorn great. Look for a stronghold that rewards you for exploring your opponent’s lands, a Meishōdō attachment that keeps your characters on the field, and Cavalry ready to track down their enemies with blinding speed! 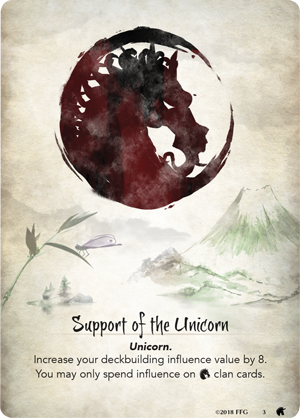 As a formerly nomadic group, It is appropriate that Warriors of the Wind makes the Unicorn the first Great Clan to have three different stronghold options. At first glance, Shiro Shinjo (Warriors of the Wind, 1) may appear to have a major handicap, as the first stronghold to produce less than seven fate a turn. But with clever play, this stronghold can yield more fate than any stronghold in the game. 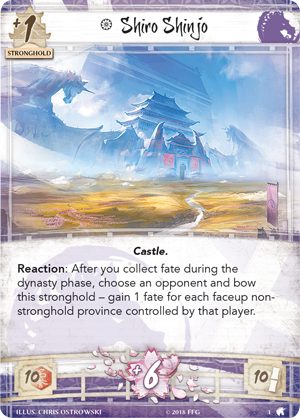 After you collect fate during the dynasty phase, you may choose an opponent and bow Shiro Shinjo to gain one fate for each faceup non-stronghold province controlled by that player! At the start of the game with Shiro Shinjo, you're guaranteed to be behind the curve on fate. However, your status starts improving the minute you start exploring provinces and revealing your opponent’s weak points. 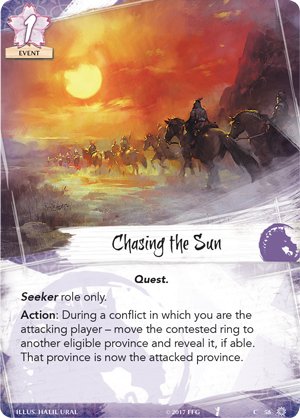 You can even reveal multiple provinces a turn with cards like Chasing the Sun (Into the Forbidden City, 58). When you reveal your opponent’s second province, you can gain eight fate a turn, and once you start gaining momentum, it’s possible to gain ten fate a turn with Shiro Shinjo! 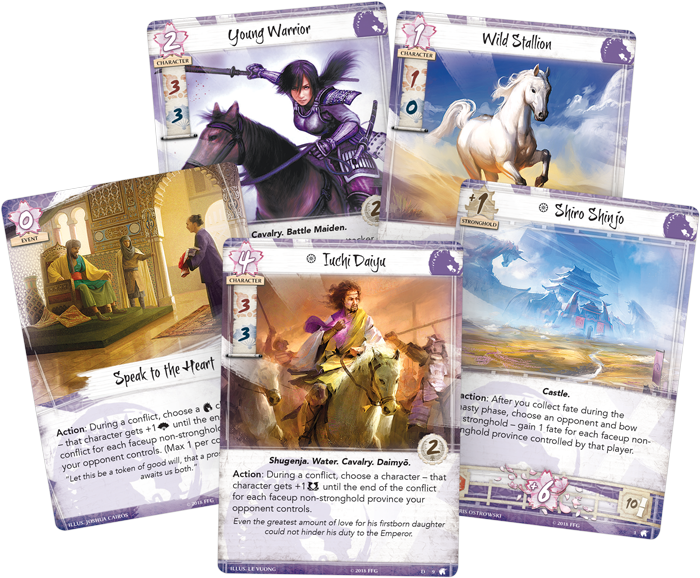 While declaring conflicts is the traditional way to reveal your opponent’s provinces, Warriors of the Wind features plenty of new ways to get an early look at the battlefields of the game, expanding the Unicorn’s theme of exploration. 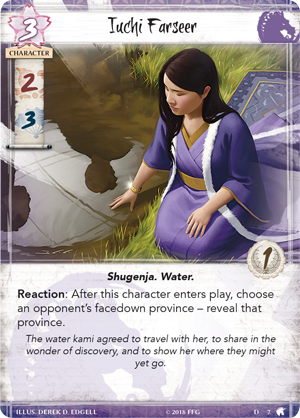 For example, the Iuchi Farseer (Warriors of the Wind, 7) doesn’t need to participate in a conflict to reveal a facedown province—simply playing her gives you information on the best point of attack and boosts the effectiveness of Shiro Shinjo! 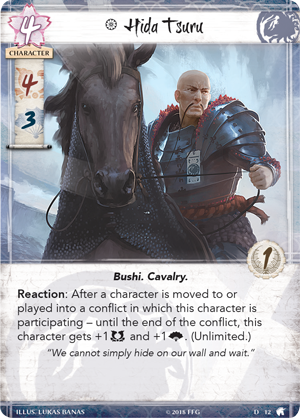 Exploration has always rewarded the Unicorn in Rokugan, and it’s no different in Legend of the Five Rings: The Card Game, especially when you have Daimyō Iuchi Daiyu (Warriors of the Wind, 9) on the field! During a military conflict, Iuchi Daiyu can boost the military skill of a character for each faceup non-stronghold province your opponent controls. Naturally, this works well in conjunction with Shiro Shinjo—revealing your opponent’s provinces will not only give you additional fate to spend on Iuchi Daiyu, it also increases his ability to assist you in military conflicts. 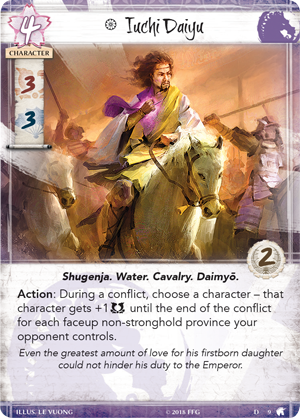 While Iuchi Daiyu uses the exploration of the Unicorn to boost their military conflicts, Speak to the Heart (Warriors of the Wind, 23) uses your opponent’s faceup non-stronghold provinces to boost a Unicorn’s political skill. 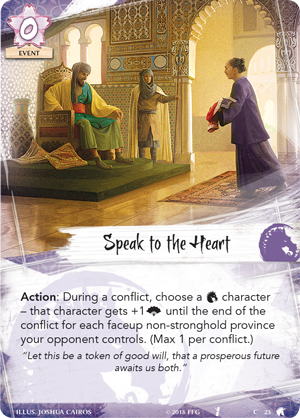 Political buffs are a rarity in Legend of the Five Rings: The Card Game, and in the late-game, Speak to the Heart becomes a potent political tool, providing a nasty surprise to your opponent when they think they have the advantage. The Unicorn use all kinds of strange and foreign items to aid them on their journeys, including compasses to guide them on their path. When your character has a Compass (Warriors of the Wind, 27) attached to them and an opponent’s province is revealed during a conflict, you may view the top three cards of one of your decks, place any number of those cards on the bottom of your deck and the rest on top in any order. 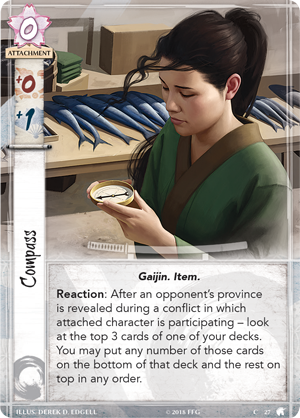 By preparing for a future turn, you can set up the perfect set of dynasty cards to place on your provinces or make the proper honor bid to get the right conflict cards. A little guidance can go a long way. While the majority of cards in Warriors of the Wind focus on the clan that rides, each of the six other Great Clans gain a new character designed to counter Unicorn strategies. For example, the Unicorn’s Cavalry are notorious for moving in and out of conflicts, but these movement options only serve to enhance Hida Tsuru (Warriors of the Wind, 12), who gets a boost to military and political skill when a new character enters a conflict. With four military and three political skill, this Cavalry character is already a threat to your opponent, and can dissuade additional characters coming to your enemy's aid. However, he also receives a boost when your own reinforcements arrive, which makes him the perfect ally for a Crab deck utilizing Support of the Unicorn (Warriors of the Wind, 3). From the mountaintops of the Dragon to the shores of the Crane, the Unicorn’s prowess is known across Rokugan. From the shrewd negotiators of the Ide to the Battle Maidens of the Utaku, this clan's time spent away from Rokugan has hardened them into warriors. Pledge your allegiance to the Unicorn with Warriors of the Wind (L5C17), available now for pre-order from your local retailer or our website! Look for this Clan Pack to release in the first quarter of 2019.